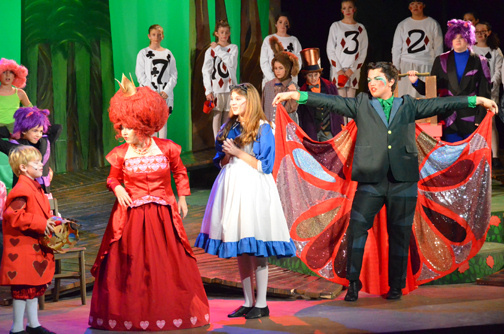 Based on the 1951 Disney film with music by Oliver Wallace, originally adapted from the books �Alice�s Adventures in Wonderland� and �Through the Looking-Glass� by Lewis Carroll. On the happy summer day of July 4, 1862, Charles Dodgson took Alice Liddell and her two sisters Lorna and Edith on a fateful boat trip along the Thames. The children asked him for a story full of �nonsense.� And so Charles began a tale about a girl named Alice who follows a waistcoat-wearing white rabbit down a wondrous rabbit hole. He would eventually refine that story and publish it in book form under the pen name Lewis Carroll � an author whose works, nonsense or not, would soon be quoted more than any other save Shakespeare and the Bible. The stories and its iconic characters such as the crazy, tea-partying Mad Hatter, the mysterious and disappearing/reappearing Cheshire Cat, and the head-hunting Queen of Hearts would also inspire the creation of many other fantasies to come, including countless adaptations like the 1951 Disney classic. 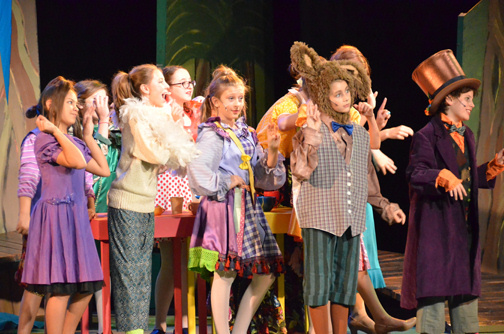 This stage adaptation of the film was developed into an entertaining musical production sprinkled with a few amusing modern references and some additional songs including another Disney classic, Zip-a-Dee-Doo-Dah. Director Dale Nakagawa and his team at Greasepaint Youtheatre staged a brilliantly creative production of this one with a cast that fully inhabits their bizarre characters. 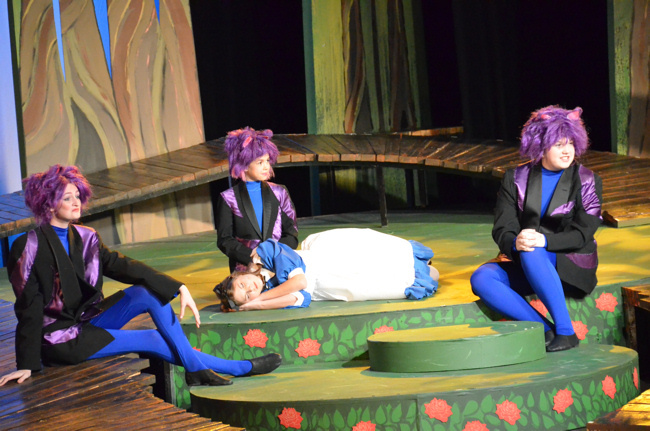 It begins in a nice park-like setting (Set Designer Kevin Beamon) where play the characters Alice will soon meet down the rabbit hole, but here in London they are just people with similar personalities who are reluctant to let Alice play with them. Nor will she have an easy time playing with their alter egos when she follows a completely time-obsessed White Rabbit, Lauren Kort, to Wonderland with the aid of three Cheshire cats. Audra Hoover, Briana Fleming, and Berkeley Lock are a hilarious team of cats, weaving their magic to make things happen in Wonderland, or resorting to less mysterious ways of making things happen when their whimsical attempts at abracadabra fizzle. 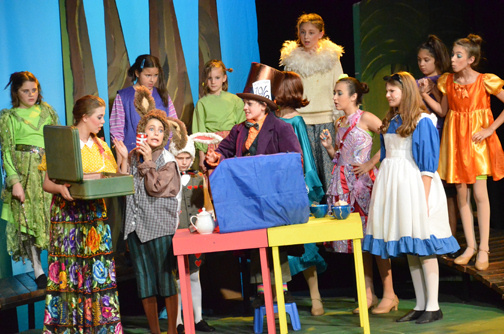 These include the magical attempts to transition between �tall� Alice (Ryan Perry), �small� Alice (Alex Kirby), and regular-sized Alice (Madeline Wessel), who are not always pleased to be kicked off stage in favor of their bigger or smaller body doubles. 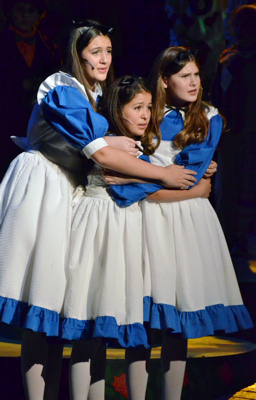 We tour Wonderland through the eyes of these three great Alice actresses who explore with curiosity, humor, and wonder � along the way making the acquaintances of some memorable characters. Real-life talented identical twins Raechel and Simone Rawicz shake hands and battle it out with humor and determined charisma as Tweedle Dee and Tweedle Dum. 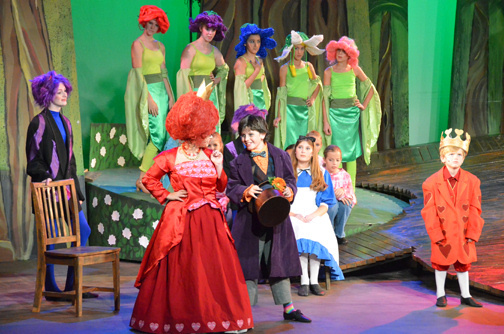 Zach Guerrero turns up the fabulosity with saucy sassiness as the Caterpillar who, along with a delightful small Alice, leads the cast in a groovy Zip-a-dee-doo-dah. The Mad Tea Party, which unfolds into an UnBirthday Party, is a huge hit featuring Johnny Depp-like Casey Likes as a Mad Hatter who becomes a mad scientist when it comes to watch repair, with a charming Katharine Wilhelmsen as fellow tea party host March Hare and the mad scientist�s eager medical assistant. Not so charming is the head-hunting Queen of Hearts, with Ally Chisenski comically intimidating her subjects and using her voice and body language to great effect. The rest of the cast shines as the English children of �Dodgsonland,� a bunch of snooty flowers growing under The Golden Afternoon, the entire kingdom caught up in a riveting trial, and the entire kingdom singing their finale ode to Alice and the Wonderland that, through shows like this, continues to enchant after 150 years.